written by Unknown and has 10 comments. - So how are you feeling ? Excited about Stockholm ? - Honestly.. I don't know. I think I'm mostly in denial. I must've had this conversation at least half a dozen times in the last month. I kept trying to figure out why the idea wasn't sinking in, to no avail. Somehow I couldn't wrap my head around the idea that I was moving to a new city. In a way every time I pictured my new life, I imagined having my Göteborg friends around me, in Stockholm.. except I'm the only one who's actually moving. Then one event changed everything for me: I sold my couch. When I got back into my apartment, and looked at the empty spot where my couch used to be, it hit me: This was the beginning of a big change. Then as the days went by and cardboard boxes started piling up in that same spot, it sunk in a bit more. Finally yesterday as I was having lunch with a friend, I realized: I'm ready to move, I'm even looking forward to it. Not because I've got nothing keeping me here anymore, not because I wasn't happy and needed a change, quite the opposite. 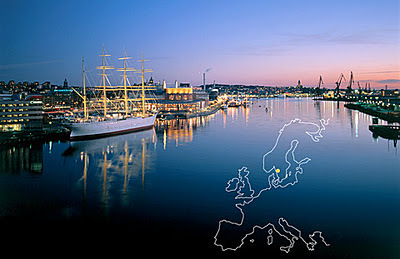 Göteborg has been the city of my dreams, and it is, undoubtedly, Home. But it's time for a new beginning, a new adventure. I guess there are several stages when it comes to moving. I'm glad I got past at least one of them. Believe me, denial is not as pretty and glamorous as you'd imagine. I'm almost all packed up, I've made all the arrangements, and by the end of the weekend I would be sleeping in a bed about four hundred and sixty kilometers away from where I am sitting right now writing this post. I don't know how I will feel when I wake up, and realize there's nobody I could make lunch plans with, but for now I can't wait to walk around Stockholm, then go back to an apartment full of my own stuff. On a last note, I was walking around town the other day, and I remembered everything I've gone through, good and bad, in every corner of the city as I walked by it. To all of you who shared those memories, thank you for being there and making these last couple of years an incredible journey (and consequently this move particularly difficult), you've been my friends, my family, my sidekicks, and as sappy as that may sound, I love you all dearly. You now have a friend in Stockholm. I hope you drop by, I will certainly do the same. "Life has some surprises for you on this one ;)"
You can't say something like this and not tell me the whole story ! Well, I can't say I don't empathize. In the last 3 years, I've started my life over in 3 different cities :) My best advice is to really "pay attention" to your first few days in Stockholm - catalog all of your initial reactions, thoughts, etc... because, after a few months, you will look back on those first moments and realize that you feel entirely different. The things that were once foreign will suddenly be normal and you'll wonder how they ever felt otherwise. I think that is my absolute favorite thing about moving: the point where you realize that you've changed and adapted without even realizing it. All the luck & good discoveries!